Well, I hope you are well-fed on black-eyed peas or whatever else you hope will make your New Year lucky! Me? Well, I’ve long held to the thought that we make our own luck…and if not, luck, well…we can certainly increase our odds. The best thing about creating good fortune when it comes to fishing is to apply rule No. 1…and that’s GO! You have to be there to make it happen. And well, if you want to eat black-eyed peas while fishing, that might not hurt anything either! On a more serious note, in today’s blog I am pondering a recent question someone posed to me. It was about sound, and what the fella basically wanted to know was how far away can a bass hear an enticing sound…one that might draw it to your lure? 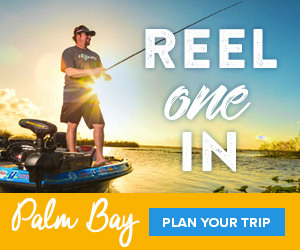 And, is that rattle/sound important to an angler? How crucial is it to have that added “sound” in a lure? Sound is important to bass, and it is perhaps their most versatile sense. Biologists tell us fish can hear things that we cannot — they not only hear sounds, they feel sounds. The inner ear is used to “hear” sounds and the lateral line is used to “feel” sound. And when you consider that sound travels five times faster in water than in air, the possibilities become very interesting. It is important to note that high-frequency sound waves from a lure can reach a bass’ inner ear at approximately 40 feet. But they cannot locate the sound without swimming a search pattern or until the sound comes closer. 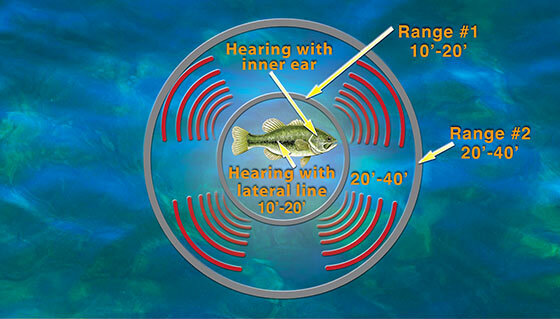 At a distance of less than 20 feet, the bass relies on both the inner ear and the lateral line. The latter is directional and allows the bass to reach out and “touch” the sound and detect a sense of direction. Another interesting note is that the water’s surface reflects 99.9 percent of sound energy in the air. Therefore, few above-the-water noises affect bass.